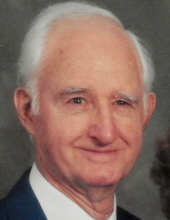 Charles Alvin Hooper, 97, of Oak Ridge, passed away Monday, January 28, 2019 at the Methodist Medical Center. He was born January 5, 1922 in Drew, Miss., the son of James Franklin Hooper and Cynthia Oza Swindol Hooper. Mr. Hooper served with the US Army Air Corp during WWII. He retired from Union Carbide Corporation, Y-12 Plant in 1987. He was a long-time member of New York Avenue Church of Christ. Mr. Hooper enjoyed woodworking and roller skating and was a devoted husband, father and grandfather. In addition to his parents, he was preceded in death by his identical twin brother, Thomas Calvin Hooper, whom they both referred to each other as “Buddy”. He was stationed with his twin brother in Mendelsham, England. His mother had to write Congress to get permission for her twin sons to be stationed together. He is survived by his wife, Laverne Lindsey Hooper, with whom he would have celebrated their 63rd anniversary on May 31. He is also survived by daughters, Kathryn Seaver and husband Gary of the Cumberland Plateau and Karen Sharp and husband Philip of Tallahassee, FL; 2 grandchildren, Savannah Sharp and Lindsey Vaughn and husband Josh; and 3 great-grandchildren, Andy, Lilly and Olly Vaughn. The funeral will be held on Wednesday, January 30, 2019 at 1pm at Weatherford Mortuary. Family and friends will meet for a graveside service at Oak Ridge Memorial Park immediately follow the funeral. To send flowers or a remembrance gift to the family of Charles Alvin Hooper, please visit our Tribute Store. Burial to follow at Oak Ridge Memorial Park. Meet in the Garden of Love. "Email Address" would like to share the life celebration of Charles Alvin Hooper. Click on the "link" to go to share a favorite memory or leave a condolence message for the family.